Funny golf towel made of 100% premium cotton with plush velour finish. 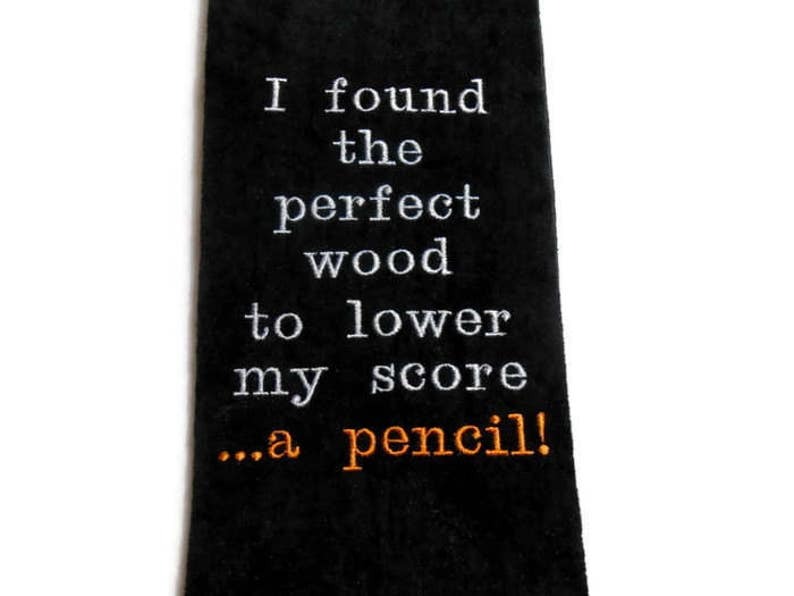 This embroidered towel is a great fun gift for the golfer that is always looking for a way to improve his score. There is a funny saying embroidered on this large sized thick towel. The towel comes with the phrase, I found the perfect wood to lower my score ...a pencil! The design measures approximately 6.25 X 4.75 inches. The thread color on the wording is light almond, grey and yellow gold, but I'm more than happy to use a color of your choosing. This tri fold, 100% cotton terry, 2-ply yarn velour golf towel measures 16" x 26" and has a center brass colored grommet and hook. This towel is perfect for Father's Day and it makes a great gift for that friend you're always competing with on the golf course, birthdays, groomsmen gifts, golf lovers, retirement...even that bachelor party last round! Designed to conveniently hang from the golf bag so it's always there when you need it! The grommet is included. Also available in black, navy blue, royal blue, purple, and red. The red towel is a side grommet rather than a tri-fold towel.